I am interested in the public realm and how it evolves to accommodate changes in technologies, trends, and demographics over time. The reiterative process of designing and redesigning cities fascinates me. As a designer, my role is to create and improve upon public spaces that make people feel good, enriching the lives and experiences of the community and creating a lasting positive change. Emily Condon is a designer in Alta’s Charlotte, NC office. With a background in plant science and landscape architecture, Emily is committed to creating sustainable public space that promotes healthy, holistic living. At Alta, Emily has gained experience in graphic representation, designing through charrette, and refining those visualizations into community-driven solutions. 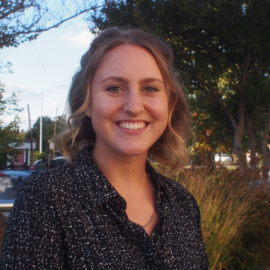 Beyond a passion for public engagement, Emily’s professional interests include public art, social equity, and placemaking within the urban realm.